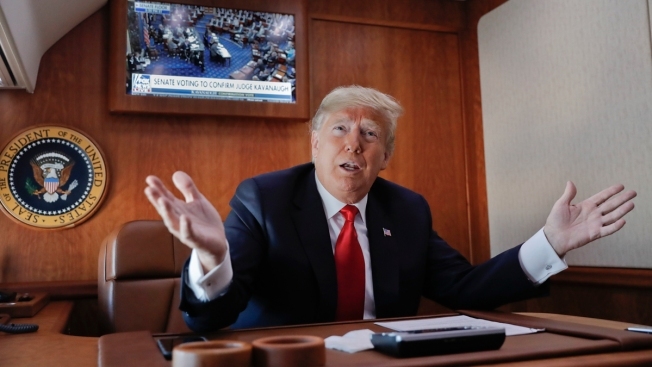 In this Oct. 6, 2018, file photo, President Donald Trump, on board Air Force One, gesture while watching a live television broadcast of the Senate confirmation vote of Supreme Court nominee Brett Kavanaugh. Trump has transformed the presidency in scores of other ways, inserting himself into matters his predecessors avoided. He has chastised his own Justice Department for not opening investigations into his political foes. He has threatened to oust the chairman of the Federal Reserve, which prizes its political independence, for raising interest rates, believing it could slow the economy. With deadly wildfires raging, he criticized Californians for poor forest management. He doesn’t attend national arts events that typically have had a presidential imprimatur, such as the Kennedy Center Honors. Mr. Trump went to Washington. And he changed it. In his first two years in office, President Donald Trump has rewritten the rules of the presidency and the norms of the nation's capital, casting aside codes of conduct and traditions that have held for generations. In Trump's Washington, facts are less relevant. Insults and highly personal attacks are increasingly employed by members of both parties. The White House press briefing is all but gone, international summits are optional, the arts are an afterthought and everything — including inherently nonpartisan institutions and investigations — is suddenly political. Taking a wrecking ball to decorum and institutions, Trump has changed, in ways both subtle and profound, how Washington works and how it is viewed by the rest of the nation and world. "He's dynamited the institution of the presidency," said Douglas Brinkley, presidential historian at Rice University. "He doesn't see himself as being part of a long litany of presidents who will hand a baton to a successor. Instead, he uses the presidency as an extension of his own personality." Is this a one-president aberration? Or has the White House forever changed? Whether the trends will outlast Trump's presidency is a question that won't be answered until there is a new occupant in the Oval Office, but Brinkley predicts "no future president will model themselves on him." There was a time, many accelerated news cycles ago, when there was speculation, stoked by the candidate himself, that Trump would abandon the bluster of his campaign and become "more presidential" once he took office. No one says that anymore. Trump himself believes his unpredictability is what holds Americans' attention and fuels his success. "I have these stupid teleprompters. You don't mind that I haven't used them all night, do you?" Trump asked the crowd at a June rally in South Carolina. "Every once in a while I look at it, I mean, it's so boring, we don't want it. America's back, bigger, and better, and stronger than ever." A judge ruled Friday that the White House must immediately restore, on a temporary basis, CNN reporter Jim Acosta's press credentials. Indeed, Trump brought to the White House the same fact-challenged, convention-defying style that got him elected. From his first days in office, Trump pushed falsehoods about the size of the inaugural crowd and unfounded allegations about millions of illegal voters. He has not let up since. The inaccuracies have been big and small: Trump repeatedly claimed in 2018 that he passed the biggest tax cut in history (he didn't), that the U.S. economy is the best in history (it's not) and that his Supreme Court choice Brett Kavanaugh finished atop his class at Yale Law School (the school doesn't rank students). Just last week, after making an abrupt, unilateral decision to pull U.S. troops from Syria, Trump tweeted that Russia was "not happy" about the decision. Hours earlier, Russian President Vladimir Putin had cheered the move. The cumulative effect has been to diminish the authority with which White House pronouncements are received. When a federal report on climate change was released last month, showing an increasing impact, a White House statement cast doubt on its findings and suggested, erroneously, that a significant number of scientists doubted the phenomenon. That drew derision from a broad swath of scientific community. The White House distributed a doctored video of an encounter between a CNN reporter and an intern, exaggerating the contact made by the journalist and damaging the administration's credibility. Similarly, when Trump threatened to shut down the southern border, most of Washington just shrugged and dismissed the threat as so much bluster. The White House press briefing, once a daily opportunity for the public to hear the president's views scrutinized, has all but vanished. White House press secretary Sarah Huckabee Sanders has held just one briefing in December and it clocked in at a scant 15 minutes. Now, the primary form of communication from the White House comes 280 characters at a time, as Trump's Twitter bursts set off cellphone alerts across Washington, sometimes taking even federal agencies and congressional allies by surprise. His decision last week to announce a withdrawal of troops from Syria left congressional Republicans complaining bitterly that they were not consulted or advised. And, despite counsel from his own party, he moved to shut down the government over the lack of money for a border wall, his signature campaign promise. President Trump picked Brett Kavanaugh as his Supreme Court nominee Monday night. If confirmed, Brett Kavanaugh will replace Justice Anthony Kennedy. "The challenge is that Trump is like a quarterback who doesn't call a play and simply snaps the ball and expects his teammates to react," said former House Speaker Newt Gingrich. A Trump ally, Gingrich said he approves of only 80 percent of the president's tweets but believes his unique style has made him impervious to criticism after he pulled out of multinational agreements in favor of deregulation and sovereignty, moves that fulfilled campaign pledges yet drew global derision. "The thing you have to ask yourself about Trump is: Could he, in fact, be as disruptive as he is in the ways in that his base wants but be more traditional on tactical things?" Gingrich said. "Or can you not have one without the other?" 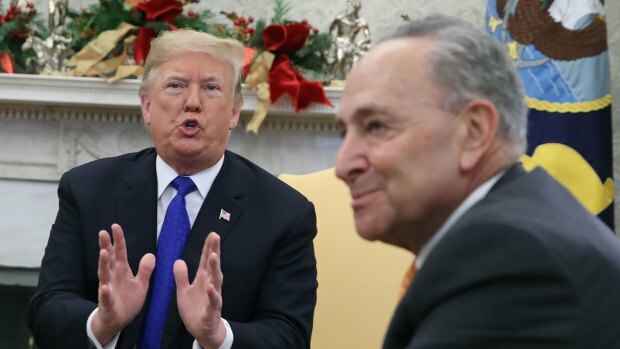 Trump's tweets often trade in public insults that modern presidents just don't share in public: The Senate minority leader is "Cryin' Chuck Schumer." The media are "the enemy of the people." His own former secretary of state, Rex Tillerson, is "dumb as a rock." And that level of insult, at times veering into the coarse and the crass, has bled into the dialogue of official Washington. Outgoing Interior Secretary Ryan Zinke, weeks before he resigned in a cloud of ethics scandals, tweeted that a Democratic congressman had struggled "to think straight from the bottom of a bottle." House Minority Leader Nancy Pelosi told fellow Democrats this month that the border wall was a "manhood" issue for the president. Trump has transformed the presidency in scores of other ways, inserting himself into matters his predecessors avoided. He has chastised his own Justice Department for not opening investigations into his political foes. He has threatened to oust the chairman of the Federal Reserve, which prizes its political independence, for raising interest rates because he believes that could slow the economy. With deadly wildfires raging, he criticized Californians for poor forest management. He doesn't attend national arts events that typically have had a presidential imprimatur, such as the Kennedy Center Honors. Some Washington institutions have held: The courts have dealt his administration several defeats and the special counsel's Russia probe continues apace. But on the world stage, too, Trump has broken the presidential mold. He has eschewed sweeping diplomacy in favor of transactional relationships. He has strained longtime alliances — including with Canada, of all places — and befriended global strongmen. He has skipped summits, including a gathering in Asia in November, that have long been fixtures on presidential itineraries. And world leaders have taken to heart that flattery, pageantry, golf and maybe some business at a Trump-owned hotel are the pathway to a good relationship with the president. "He is a sui generis president," said Brinkley, using the Latin for "unique." ''Trump doesn't know history and doesn't model himself on any president ... but he's all we can talk about."